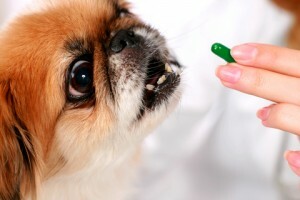 One of the oldest known tricks to get your animal to take their pet medication is to hide the pill in a glob of peanut butter. Your cat or dog is certain to lick every bit right up as they down what they believe to be a tasty treat. Or if you have the time and the proper tools – the back of a spoon works great – you can also crush the pill into a powder and mix it in with some yummy applesauce. I buy a hollow treat and put the pill inside. It works every time. Look for it at your local pet store. They’re call “Greenies” Whichever method you choose, your pet will lead a happy and healthy life! Check out Classic Rock. Modern Rock and lots of classic hits on THUNDER ROCK 101. It can be found on THE EDGEWATER INTERNET RADIO NETWORK! This entry was posted on Wednesday, July 30th, 2014 at 11:09 am	and is filed under Pet Supplies. You can follow any responses to this entry through the RSS 2.0 feed. You can skip to the end and leave a response. Pinging is currently not allowed.